The escalation of the reliance on standardized testing as an assessment mechanism is hindering our ability to focus on the individuality of our students, and to help them identify and prepare for their unique calling and vocation. It is said that everyone has the ability to perform at genius levels at “something.” Our job is to help students discover what their particular “something” is. I believe that in this world there are too many square pegs trying to fit into round holes due to fear or complacency, or because they were not given the proper tools of self-discovery. The greatest productivity gains that we as a society can achieve is by realigning those pegs. In a related note, here’s a trailer for the movie Race To Nowhere, an indie film project about the current status of our education system, driven by a concerned parent. A fellow music education advocate recommended the film Race to Nowhere. I must say that I haven’t had the opportunity to see the film, but the trailer echoes many of the frustrations with the direction of education that we’ve discussed here previously. The film is being screened in selected markets and will be released this fall. The film website also has links, resources, and tools to get behind this message. It’s also important to note that testimonials indicated that the movie leaves you with a sense of hope rather than just taking the easy route of bashing education and leaving the viewer frustrated. As I’ve stated previously here in a letter to the Aspen’s Institute on No Child Left Behind, “Our ability to meet performance metrics is meaningless if those metrics are not a true measure of the needs of our students.” Any thoughts from those who may have seen this film would be appreciated. Diane Ravitch is the research professor of education at NYU and the author of The Death and Life of the Great American School System: How Testing and Choice Are Undermining Education (2010). In “Just Say No to the Race to the Top” she discusses how although standardized state tests are considered inadequate and a poor representation of the effectiveness of an educational institution (even acknowledged by Secretary of Education Arne Duncan), educators are held hostage by test-based methods in terms of allocation of dollars, teacher evaluations, and classroom priorities. It’s interesting that there are several dozen comments to this very articulate blog post, mostly from educators who share her frustrations. Schools have been demoralized by these standards, and studies indicate that the greatest prerequisites of effective education are a motivated teacher and a motivated learner. If teachers, parents, and students are fed up with the obsession on standardized tests, who’s steering the ship? The well-intended implementation of the No Child Left Behind Act has resulted in increased emphasis on standardized testing in our schools and fewer resources available for subjects other than reading and math (including music and the arts). The Aspen Institute’s Commission on No Child Left Behind is holding a hearing in New Orleans today to discuss education standards, data, reform. etc. My comments submitted for the record are noted below. You can provide written comments for the public record via e-mail. Click here for more info. AFFILIATION: Music Education Advocacy author and speaker. 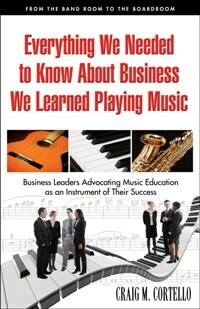 Author of Everything We Needed to Know About Business, We Learned Playing Music (La Dolce Vita Publishing, 2009). 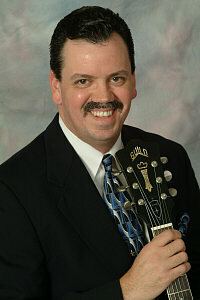 A 20 year veteran of engineering, consulting, and manufacturing industries and a 30 year guitarist/pianist/songwriter. Contributing music writer to Where Y’at magazine in New Orleans and AllAboutJazz.com. Business articles have appeared in Convention Forum, Industrial Engineer, and Executive IdeaLink magazines. From the perspective of the arts community, No Child Left Behind was seen as a significant victory, in the sense that it recognized “Arts” as a core academic subject. As is often the case, there seems to be a disconnect between what has been written into law and what is in fact reality. Over a period of 2 years, I conducted interviews with 32 CEOs and business leaders who played music as a child or adolescent and view that experience as a defining one in preparing them for success. The compilation of those interviews and profiles became the primary content of my book entitled Everything We Needed to Know About Business, We Learned Playing Music, published in September of 2009, a copy of which I have submitted for the record. And therein lies the irony. In short, music education IS a no child left behind program. It keeps children that don’t necessarily shine according to traditional metrics of student performance involved in school. Sometimes tutoring and remedial course offerings are not enough to keep children on the bus. We need to find a motivating reason for them to want to come along for the ride. It does seem to me that the very well-intended accountability motives that have driven the demand for standardized testing have led us to a more narrow approach to education. These changes come in an era when the workforce is demanding more well-rounded, diversified individuals possessing artistic sensitivities, as expressed very articulately by authors such as Daniel Pink, Sir Ken Robinson, Ned Herrmann, and John Kao. Creativity is just one of 9 common lessons that we identified from music education that translate into business success, FROM THE BAND ROOM TO THE BOARDROOM so to speak. One common theme in most all research on the topic of creativity is the concept that creativity is like a muscle. The capacity for creative thought will either strengthen with use or wither with inactivity. We must engage in creative activities in order to develop that capacity. My concern – Where will our children have the opportunity to strengthen their “creativity muscles” without music and arts education in our schools? In closing, I would like to simply say that until we recognize that music and the arts are as essential as reading and math in preparing our students for the 21st century workplace, any perceived improvements through the implementation of accountability measures are hollow victories. Our ability to meet performance metrics is meaningless if those metrics are not a true measure of the needs of our students. James Carlini is an international business infrastructure and technology consultant and a former distinguished teaching award recipient at Northwestern University’s School of Continuing Education. He advocates a movement away from the 3 R’s of education that were appropriate for the industrial age toward what he refers to as the F-A-C-T approach toward education – that is, a focus on Flexibility, Adaptability, Creativity, and Technology as the necessary cornerstones of a post-information age education. And music and the arts should play an integral role in that migration. I ask you to reverse this disturbing trend of diminishing resources for music and the arts. In this video, Dr. Yong Zhao of Michigan State University’s College of Education discusses the effect of standardized testing and the narrowing of educational focus on global competitiveness. Dr. Zhao warns of this approach and discusses the lessons we can learn from China’s approach.